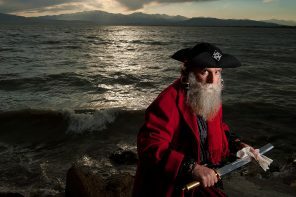 Are you into pirates and always up for learning more about these intriguing and larger than life individuals? 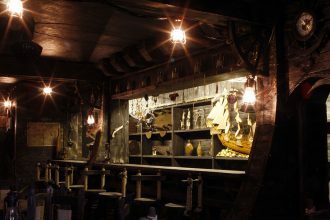 Hundreds of years ago between the 16th and early 18th centuries during the Golden Age of Piracy, most news that related to pirates was usually shared by word of mouth. Over time, writers and authors started to document pirate escapades using the written word. As a result, pirate books started appearing that revolved around some of the most famous pirate’s lives and their adventures on the open seas. 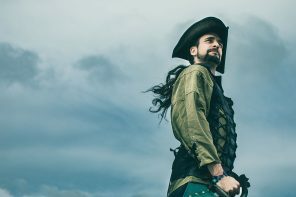 Read below to learn more our top 6 pirate books that are based on historically accurate records and real life experiences with pirates. In addition, some of these noteworthy works served as the inspiration behind famous pirate myths and stereotypes that are still present today. “A General History of the Pyrates” is often referred to as the book that introduced civilian society to pirates with its detailed descriptions of pirate daily life and their adventures on the open sea. Also regarded as the first literary work to create interest about the pirate lifestyle, this book had in-depth details about pirates that roamed the Caribbean seas in the late 17th and early 18th century. Today, this book is still a favorite pirate book and it not only defined our modern opinion of pirates, but it also served as a starting block for other authors who consequently earned a living writing pirate novels. A General History of the Pyrates is an extremely detailed look at what it was like to be a pirate on the open sea during the Golden Age of Piracy. 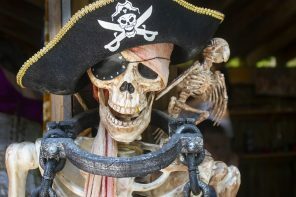 It includes references to pirates without legs, eye patches, buried treasures, and elaborate “Jolly Roger” flags that we still associate with pirates today. One downside is that this book can be a bit hard to read as it uses an authentic old version of English that has complicated sentence structures and words that are not commonly used in the English language today. Do you really want to understand what a regular day was like for a real pirate? If so, than this book is perfect for you. While pirate history has been romanticized by myths, legends and pirate images, this book was based on facts and historical document. Written by David Cordingly who worked as the head of exhibitions at England’s National Maritime Museum, this pirate book is centered around true historical events about pirates and pirate hunters. 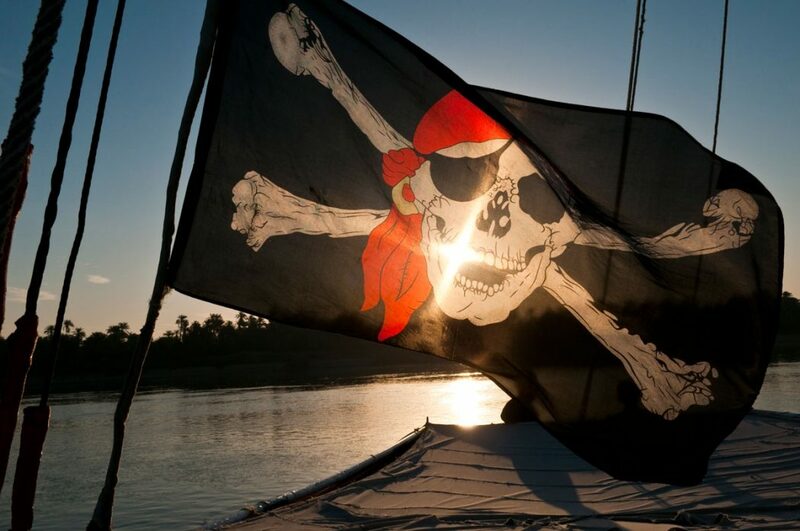 Pirate hunters tried to stop pirates and confiscate the gold and treasure they had obtained along the way in their escapades. With many historical records taken from original documents, this book also addresses modern pirate myths and helps to separate fact from fiction. Ideal for modern readers, this top pirate book is easy to read and includes interesting pictures, maps and historical documents. Author Colin Woodard is behind this novel which closely details the entire Golden Age of Piracy and focuses on famous pirate captains including “Black Sam” Bellamy and Edward “Blackbeard” Teach. Bellamy and Teach were a team that decided to join forces and form the infamous Flying Gang pirate entourage that ran a terror campaign throughout the Caribbean and Atlantic for many years. This book talks about the origins and the exploits of this infamous group, and it also discusses what a pirate haven is which was a place where pirate outcasts could find sanctuary from government prosecution. Using information obtained from numerous historical documents, testimonies, court files, and scribes that he collected over the years, this historical book also humanized pirates and depicted them as regular people living incredible and interesting lives. This book is focused on the life of a famous pirate hunter named Captain Kidd who was a Scottish naval captain who tried to put an end to piracy. Ironically, he was actually executed for piracy himself after returning from a voyage to the Indian Ocean. Many modern historians believe that he was wrongly convicted and put to death for a crime he did not commit. While there is not much known about many of the pirate hunters, this book was written using information gathered from actual historical documents, testimonials, court files and other sources. The result is a pirate book that will captivate its readers and invite them to imagine what life was like as a pirate hunter in the late 17th century. With many detailed descriptions of the pirate lifestyle and East India Company captains, this book will be a perfect choice if you want to learn more about pirate hunters that were on the trail on some of the most dangerous pirates at the time. Did you know an authentic pirate ship wreck was discovered under the waves of Caribbean? This ship wreck was the inspiration for this pirate book called The Whydah: A Pirate Ship Feared, Wrecked, and Found. The Whydah was a pirate ship commanded by fearless pirate Black Sam Bellamy, who was also known as the Prince of Pirates or Robin Hood of the Seas. Bellamy regularly terrorized the Atlantic during the years between 1716 and 1717. Offering an insider’s view into Bellamy’s life and adventures, this pirate book explains how Bellamy and his crew managed to amass a great fortune in a short period of time. Many years later in 1984, his sunken ship was discovered and author Martin W. Sandler was able to obtain comprehensive information and material from the shipwreck that helped make his book another top pirate book choice. This top pirate book covers the harsh realities of pirate life, and also helps to expose pirate myths and stereotypes. The final choice for a top pirate book is called Pirate Hunter of the Caribbean. This pirate book covers the harsh daily lives of people who were tasked to hunt pirates across the Caribbean and Atlantic. In specific, this book provides extreme details of real life exploits of Captain Woodes Rogers who was a professional pirate hunter during the Golden Age of Piracy. This novel touches on various subjects of pirate life which include the general history of that time period, as well as political and economic environments that contributed to the rise of piracy. We hope you enjoyed this list of the top 6 pirate book reading list suggestions. Now, the only question is, which pirate book do you want to read first? Previous articlePirate Pets: Myth or Reality?